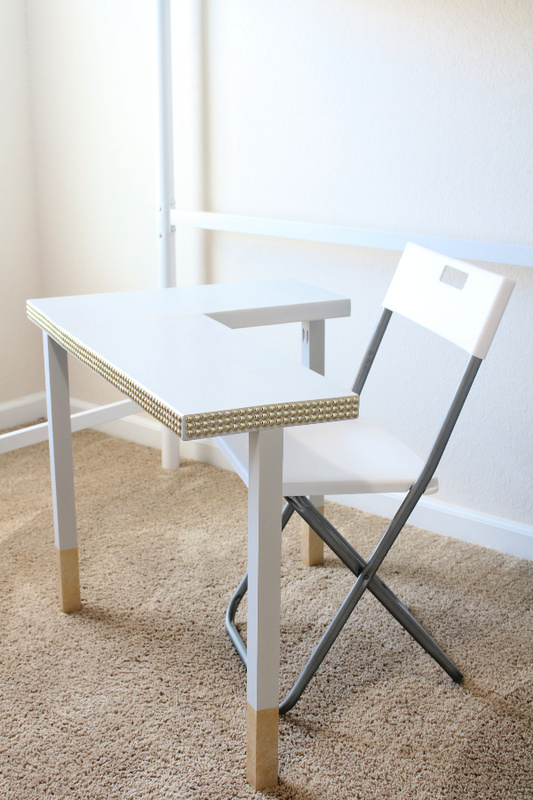 This small kids desk is easy to make and space saving too! 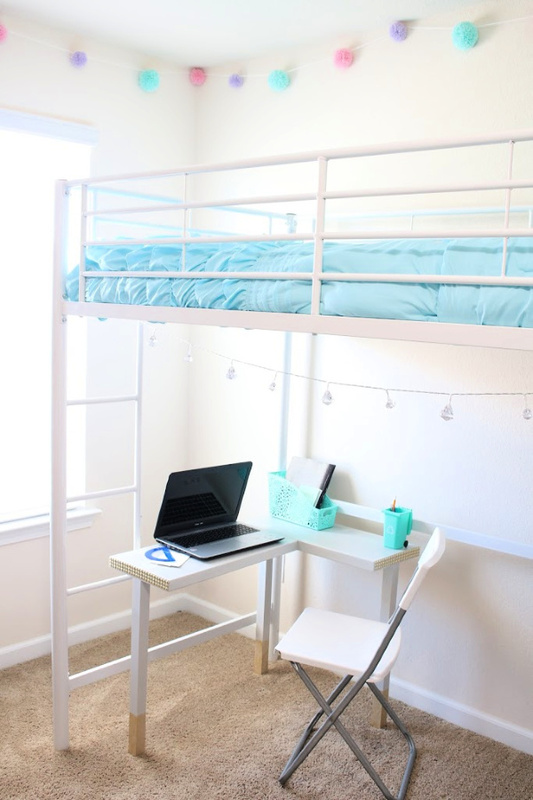 The L shape makes it easy to tuck this desk into any corner of a room! *If you are planning to try this project, checkout my tips at the end of this post for a few things I would’ve done differently (if I’d known beforehand). Connect the 2 pieces of 2 x 12 with the mending plates creating an L shape (90 degree angle). Be sure the edges line up well and use a clamp to secure the pieces together while pre-drilling holes for the 1 inch screws. 2. Drill the pocket holes in each of the 2x2 pieces and attach to the bottom side of the L shaped desktop using pocket hole screws. I attached one leg at the center of each outside edge. That’s all there is to building this simple kids desk! The height of this desk is just under 26 inches (which is good for 8 to 12 year old’s). Now you can decide how to finish it. There are so many options, i.e. raw wood, stained wood, painted (with the hundreds of paint options out there). I decided to use spray paint. I guess you could say I took the easy way out! 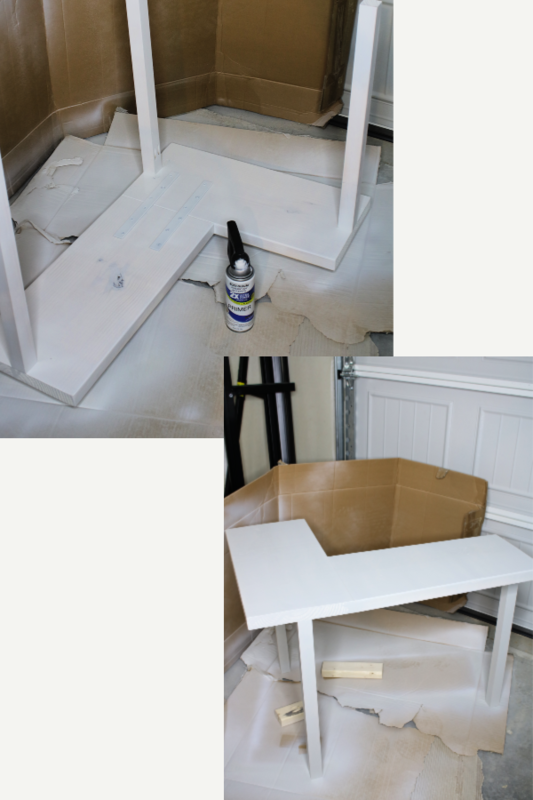 I applied 2 coats of white primer before adding about 3 coats of a matte gray color by Rustoleum. It looks white, but it is a very light shade of gray. I then decided to add some details to cover up a few imperfections. I added a metal like stud trim, that I found at Hobby Lobby on clearance, to cover up the rough outer edges. I also stenciled a design along the seam where the two tabletop pieces connect (it’s hard to see in the picture) to camouflage the seam where the wood filler cracked. I also decided to add a gold detail to the bottom of each leg to tie it all together. Opt for pocket holes instead of the mending plates for a tighter joint. If you want to have a smooth seamless top, try paintable/stainable caulk instead of wood filler, the mending plates make it so the joint shifts slightly. Caulk is generally a little flexible. If you decide to use spray paint, follow the directions exactly! Dry times are very important and it is best to use a few light coats rather than fewer heavy ones. I had some paint bubbling after applying a heavier second clear coat. It’s not too noticeable from afar after sanding it down, but I could’ve avoided it by being a little more patient! Another tip for painting raw wood is to cover the raw edges with wood filler for a smooth edge. Anyway, my girls love their new desks and that’s all that matters to me! Are you a homeschool parent, and if so do your kids have their own desk? Save this project for later!